Taylor Fouts, of soybean fame, standing with his wife and three children. 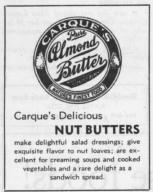 Carque's pure almond butter: Nature's finest food (advertisement). 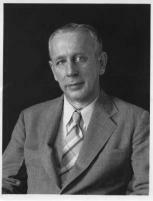 William Morse, of soybean fame. Bill Baker (who worked with soybeans), his wife, Clarke Irvine and two other people near his home at Lake Sherwood, California. Bill Baker, who worked with soybeans. Clark Irvine, of health food fame. 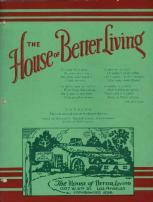 The House of Better Living Catalog (Mildred Lager, soybeans). Blowup illustration of the House of Better Living (Mildred Lager, soybeans). 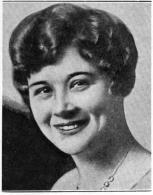 Portrait of Mildred Lager, who worked with soybeans. Mildred Lager, who worked with soybeans, conducting a free cooking class in her kitchen at The House of Better Living. Packages of various "Bill Baker's Soy & Lima Bean Products." 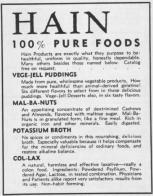 A 1/4-page ad titled "Hain 100% pure foods." Taylor Fouts, of soybean fame, standing with his wife and two daughters. Graph showing net U.S. soybean imports and domestic production from 1912 to 1936. Bar chart showing "Factory consumption of soybean oil in the United States for various major purposes" from 1929 to 1936.